Cut the English Muffins in half and arrange them on a baking sheet. Bake for 2-3 minutes, until lightly golden brown. Remove from oven. Add 2 tablespoons of marinara sauce to each English muffin. Cover with cheese and add peppers, to taste. Bake for an additional 8-10 minutes, or until the cheese is melted and golden brown. Incorporate other veggies, such as mushrooms or onions. As the frenzy of the holidays comes to a close, I'm working on returning to my routine. This, in part, means trying to be more consistent with the food we eat at home. 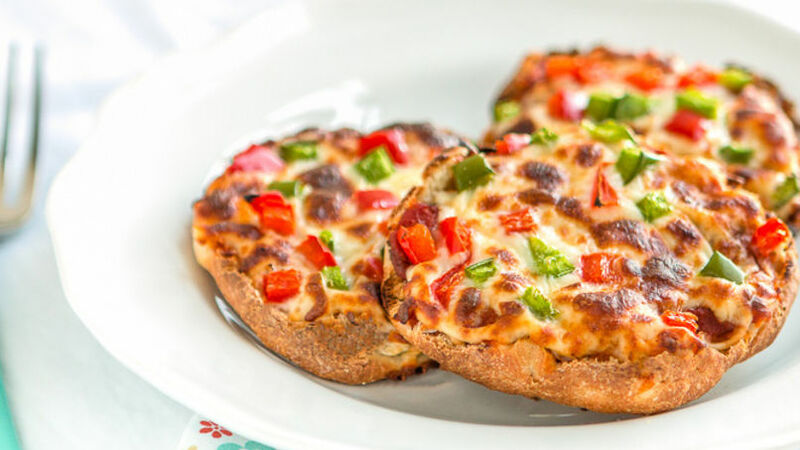 I love these mini pizzas since they taste so good and the portions can be easily controlled. I don't have a lot of time to cook during the day, and that's precisely what makes this recipe so convenient, in addition to being tasty. I like to toast the English muffins before adding the sauce, since I like them crunchy. The best part of this meal is that each person can personalize their pizza adding other veggies or toppings. ¡Buen provecho!